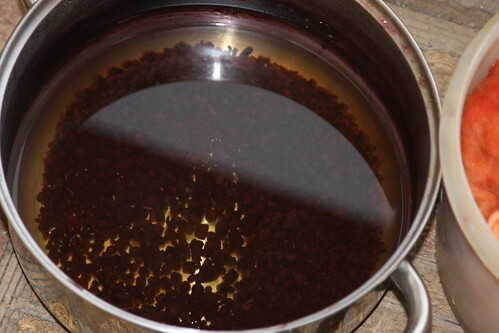 Finally – I have reached a clear dye bath with the Madder..
Dye Bath 4: Boiling for up to four hours. I managed three in the end and the water is totally clear. Even though we have hard water in Bristol, it hasn’t gone a deep brown, but love the claret shades all the same. On the Left hand pot – Left is Dye Bath 1, Right is Dye Bath 2, and the pot on the right is Dye Bath 3 – I hope the gorgeous shades of merlot show up here. Brought to 700 for an hour. An old chip pan basket seemed to do the trick, keeping the fibres out of the madder chips. 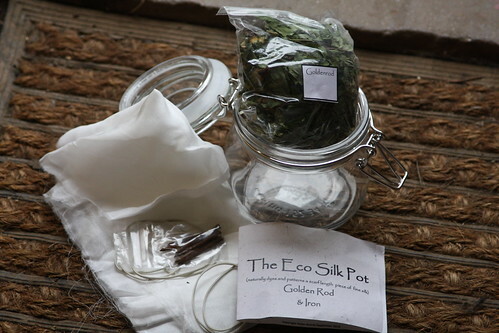 Whilst I was finishing off Dye Bath 4: I got out the Eco Silk Pot which I had also bought last weekend and have put the Goldenrod into the kilner jar to soak overnight. 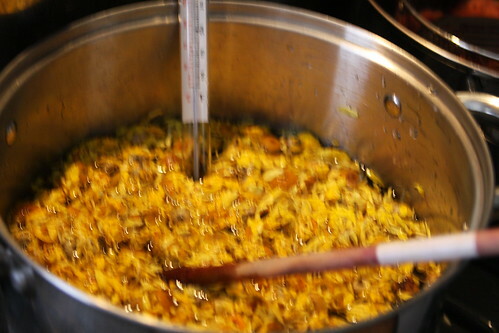 I have also put the dyers’ chamomile (50g of which was also in the Kit) on to make extract the dye (the instructions said there was no need to steep). At this point the house smelt beautiful from the chamomile, but I managed to set off the fire alarms, and despite DH’s and my best efforts they went on for some considerable time.. !! Eventually Dye Bath 4 finished. From Left in clockwise direction– DB1: DB3, DB4 and DB2 (being the peach). Because the weather is so appalling I haven’t washed them out yet, and as you can see DB 4 rather got emerged in the chips despite my precautions, because the water kept boiling reducing the water level. I am sure it will come out in the wash though.. I will do the iron modifier either tomorrow or Monday me thinks. I still have the liquor from DB1 – which is the only exhaust I have, so might try to see what that is like before the iron. Finally proof of the pudding 400 gram of beautiful variegated tones - peaches and corals, with absolutely no waste at all, from 50gram of ingredients - now that is what I call a bargain !! The kit from Fiery Felts really was value for money and not just a pretty book (although the book is lovely to handle, rather than the mass produced ones it has to be said). Despite my initial reluctance to engage with natural dyes, based on some very mixed memories and very inspiring, but wet workshops a couple of decades ago, I am pleased that I took the time and gave myself the space to have a go at these. I think the real problem was confidence. My note taking and memories of natural dyeing days in Wales with my friends, whilst happy, were mainly consisting of confusing alchemiac equations and a lot of phaffing, and industrial amounts of mordanting. I am very much of the instant gratification when it comes to colour, and this was all very confusing and didn’t appear logical to me, although the course leaders were brilliant, the knowledge and logic didn’t sort of filter down to me, due mostly to the large amount of people present. 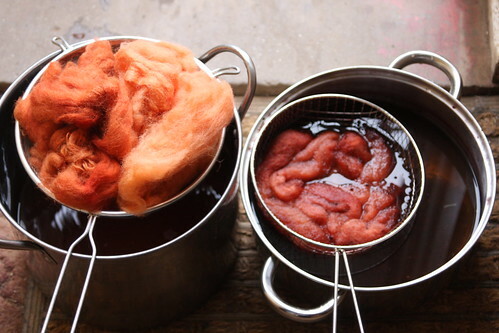 Having been gently eased in with the extracts this time round from D T Crafts who was very helpful with my acid dyeing problems a few weeks ago, I am so pleased that I have taken these experiments further, but they have taken a lot of time to get myself organised to do. That said, now I am organised it won’t be such a problem again in the future, and I have found that by timing the steeping and boiling around other chores, I haven’t had to put daily life and crisis on hold as I had expected. I am concerned that larger quantities might be more difficult to manage, but I think if I go up to bucket size that should sort that. Also the readily available after sales support I got from the suppliers was really a bonus that you don’t take into account when buying the products. When I was stuck, as I have been, both Helen and Debbie have been incredibly user-friendly and understanding, and very prompt in their responses. I did not feel that I was ever asking a stupid question (although I suspect they have been asked it a number of times before!). Because of this I felt able to play and let my creativity do its own thing – in a logical controlled sort of way. I must say that through all of these past few weeks I have felt incredibly supported by the dyeing fibre community in general. The amount of knowledge freely available to this newbie is quite outstanding, and I have a few projects sat waiting further investigation…Jane Deane sold me some pure tinctoria and other natural dyes the other Saturday, one of which involves nail varnish remover to release the colour, so I am waiting for a fair day to tackle that. 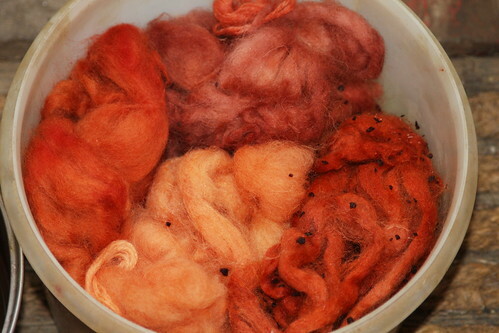 Also, chatting through with friends last night, I think a dedicated dyeing space has to be found in my new world. I have been left with a profound sense of achievement that I had not felt possible to achieve and my jadded acid-dyeing sensibilities have been refreshed with new possibilities. So, looking at my pallet this afternoon, there seems one obvious colour missing – blue. Now I am SCARED of blue, woad and indigo vats seem bordering on the instructions for making gold me finks…or are they? I have ordered a kit this afternoon.. I am holding my nose, ready to leap…I am going in..
You know – I might even be a proper dyer at the end of all this? It is actually quite an adventure for me, and if this is not being normal as I was accused of, then I am actually quite sorry for the “normal” people – they miss so much !! Unconditional Colour and warm friendships along a slow contented smile on my face.. not bad for a wet cold November afternoon eh !